100% I'm organic. Textured not lumpy. No added sugar or salt - I contain naturally occurring sugars. No big lumps and nothing artificial. Just yummy organic food for babies.Hello, I'm an organic chicken, veg + rice meal with mixed spices. I'm yummy and perfectly balanced for growing babies. Who am I for? My ingredients and textures are suitable for babies from 7 months. 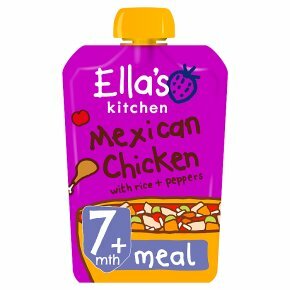 My flavours are a new journey for tiny taste buds to explore and my texture is designed to encourage your baby to begin to chew. Using me: Squeeze me into a bowl or straight onto a spoon. Older babies may enjoy slurping me from my pouch! To warm me, stand me in hot water or squeeze me into a saucepan. Always be careful, hot food can burn. Always test my temperature before feeding me to your baby. Never put my pouch in the microwave.